Each of the 28 fragrances in the Atmosphere collection is an extraordinary masala Indian incense. Masala incense is made in a method which uses natural resins such as balsam together with a complex combination of oils and herbs that are combined to form a soft dough-like mixture. This mixture is rolled on to a bamboo stick then lightly coated with sandalwood powder. The result is a far superior incense which burns very slowly and the after-aroma can remain for days. 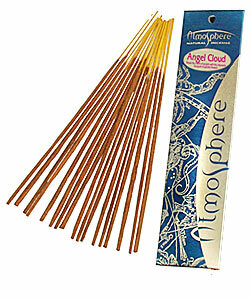 Each packet contains approximately 20 grams of incense sticks, which averages about 18 to 20 sticks. Each incense stick burns for an hour and the fragrance will linger for days.